This collection is a tribute to Japanese art. What are my sources of inspiration? Essentially the genre “Ukiyo-e” (picture of the floating world, produced on woodblock prints) and the style of the artist Ito Jakuchu (1716-1800). But also the key symbols and elements of the Japanese culture. 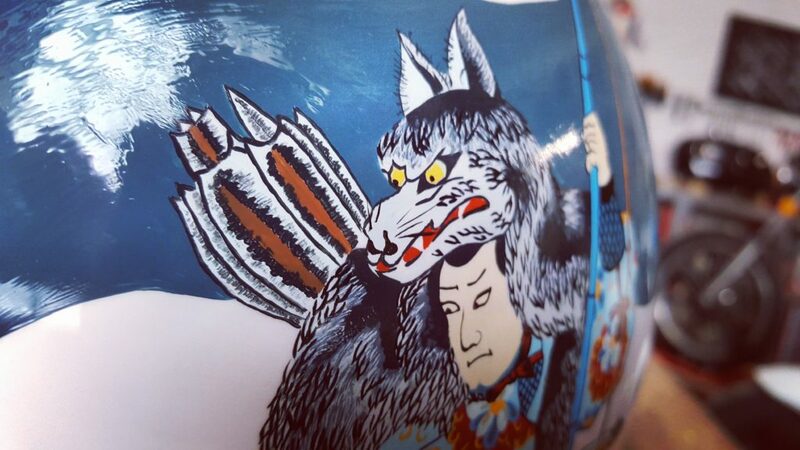 Four Japanese masterpieces compose the below helmet: the geisha of Utagawa Kuniyoshi (1798-1861) on the right, the samurai with a wolf skin presumed from Toyojara Kunichika (1835-1900), the red sun and crane of Isoda Koryüsai (1735-1790) and the chrysanthemum. 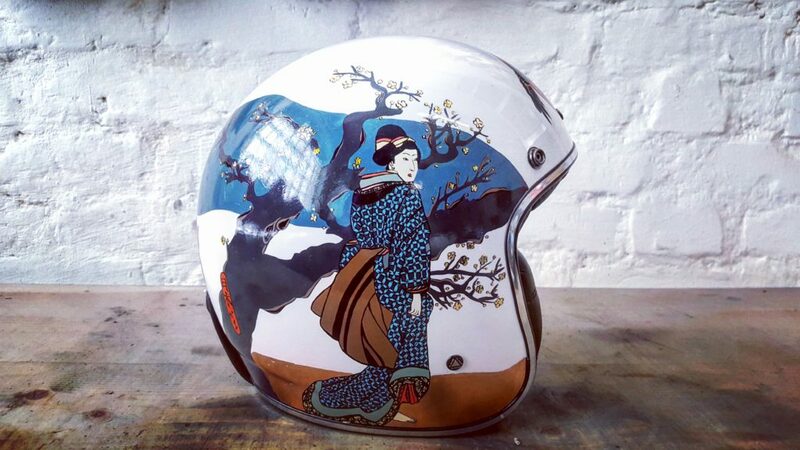 First, the geisha on the right side of the helmet. The same side of the brain is responsible for intuitions, creativity, imagination and emotions. 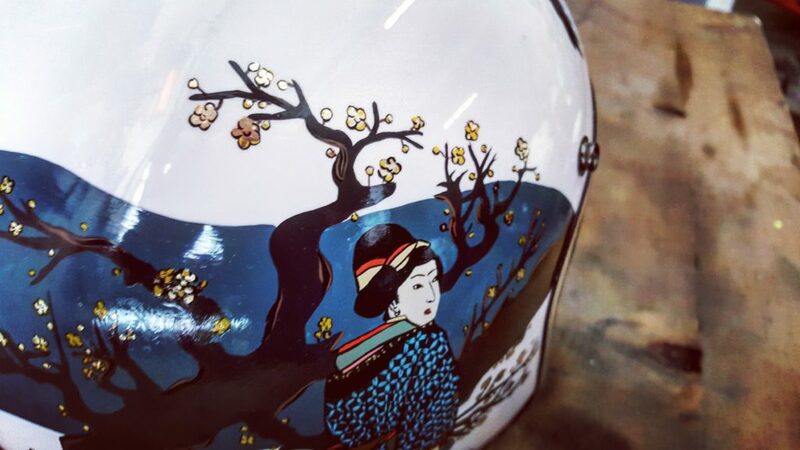 In the Japanese tradition, geisha are women artists who dedicate their life to the artistic practice of traditional Japanese culture. 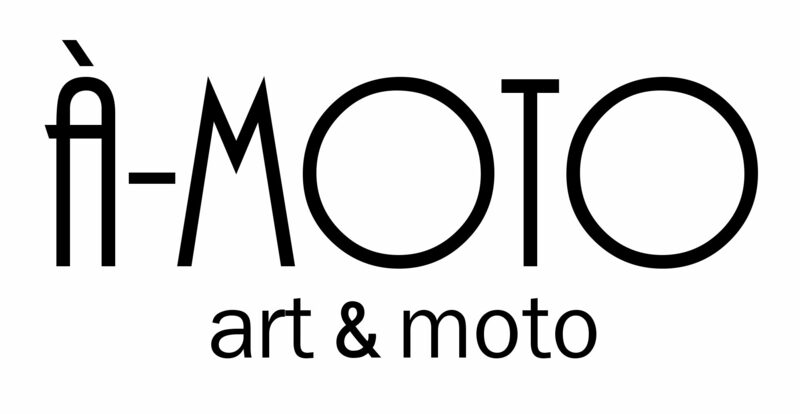 Symbols of beauty, art and life. In the background stands a Japanese flowering cherry, representing the ephemeral and sensitivity. Then, the samurai on the left side. The same side of the brain is Cartesian and logic, sequential. Symbol of war, fight, protection and death, the samurai is represented with its usual weapons: the katana and yumi (arch). He is wearing a skin of a wolf: an animal symbolizing both destruction and protection. 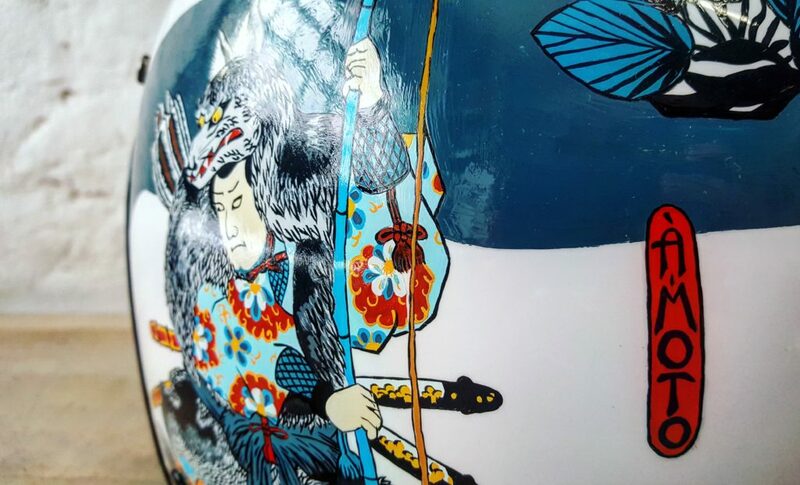 The geisha and samurai are at the opposite of the helmet: a metaphor for life and death, creation and destruction. The chrysanthemum symbolizes immortality. 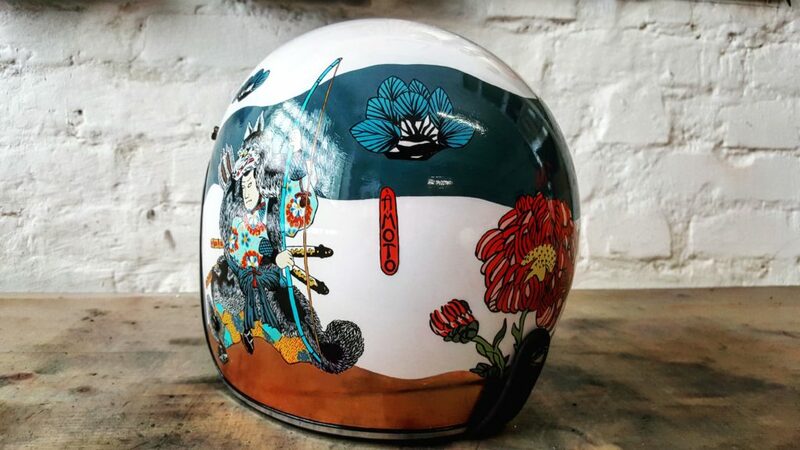 I painted it at the basis of the helmet, so as to correspond to the earth. Seen as the “noblest flower” in Japan, it blooms in autumn and is still celebrated during the “chōyō no sekku” (festival of chrysanthemum) on the ninth day of the month of September. 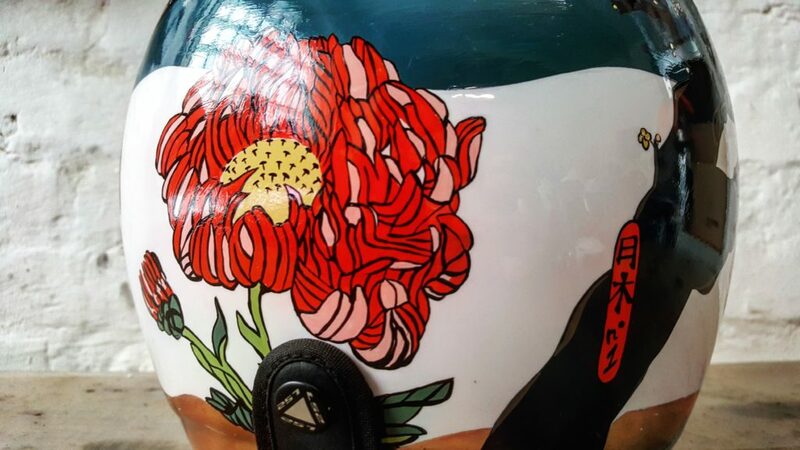 The flower is in the middle of the helmet, as a light between the geisha and samurai. 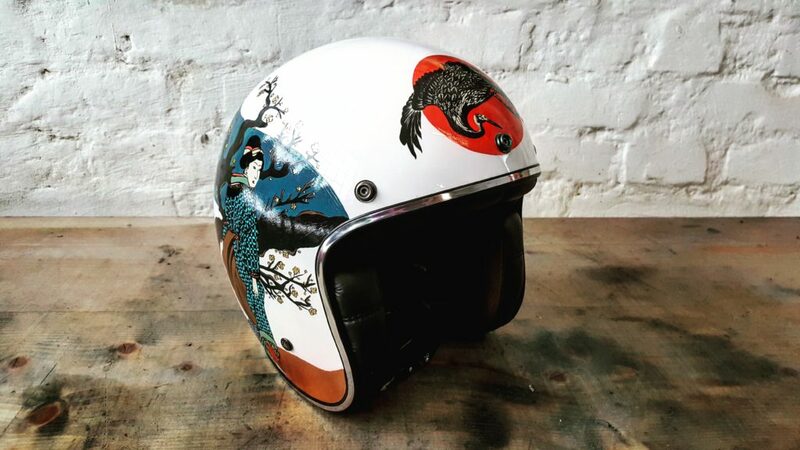 Finally, the crane on the top of the helmet. Often represented with a white plumage and a red comb, it also symbolizes immortality and is one of the tallest bird on earth. The red sun in background refers to the name of Japan as a country: the Land of the Rising sun. 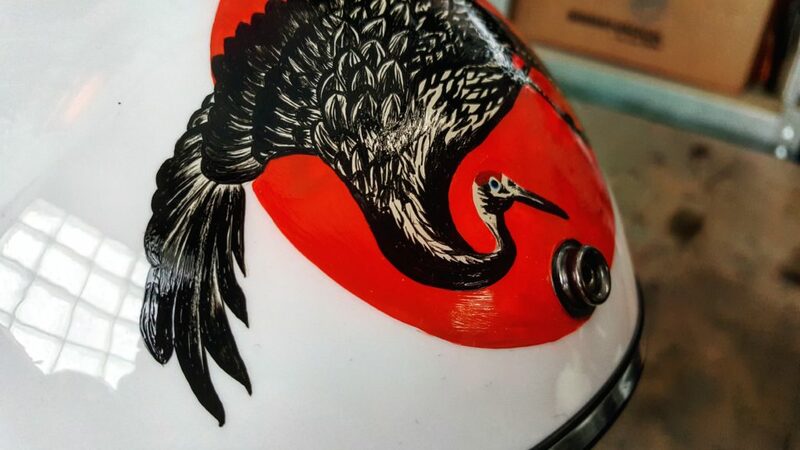 I choose to paint it on the highest point of the helmet as a nod to the sky in which the crane is flying. 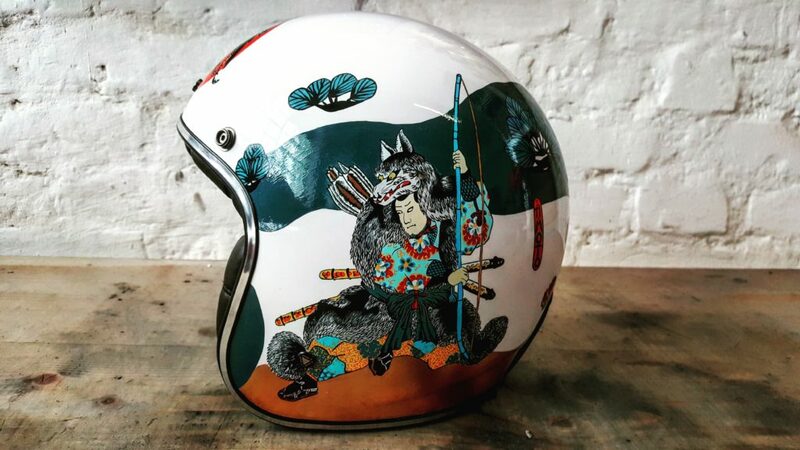 Discover more helmet creations right there! 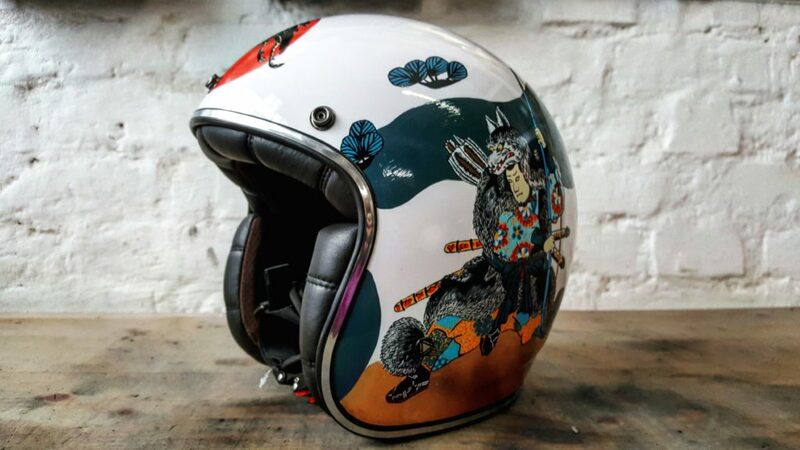 Do you want to customize your helmet? Here is how it works.